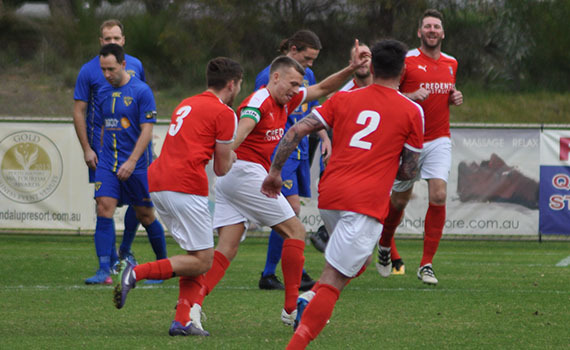 The Jacks have kept their top four finals hopes alive after a great performance to beat fourth placed Inglewood United 3-0 at the ECU Football Stadium on Saturday afternoon. Skipper Daryl Nicol gave us the lead early, before Tommy Amphlett doubled our advantage before half time. The points were wrapped up 12 minutes from time when Nicol added a second, to make it 19 goals for the season for the league’s top goal scorer. 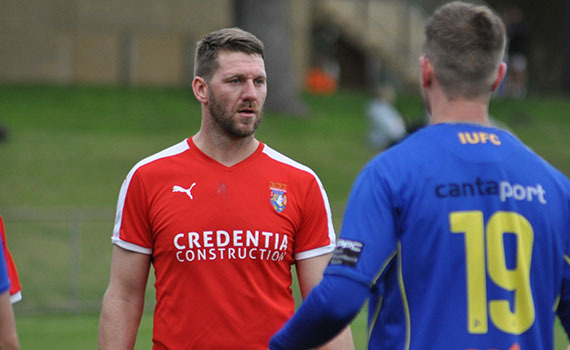 Click here to listen to Head Coach Dale McCulloch and defender Adam Tong’s post-match interviews. McCulloch made one change to the side that beat Stirling Lions last week with Cian Hirrell returning at right back with Brad McDonald dropping to the bench. Inglewood went into this one on a seven-game unbeaten run but found themselves behind after only five minutes. Ross Millard surged toward the box, but was brought down on the edge of the penalty area, and Nicol superbly curled home the resulting free kick. The home side were well on top and it wasn’t a surprise when they doubled their lead on the quarter hour. Tom Hough played the ball out to Amphlett on the left, who eased past his marker and raced into the penalty area and finished clinically past Alex Dunn. It was almost three moments late, Nicol’s free kick from out on the left hit the crossbar and away to safety. Inglewood steadied and almost pulled one back on the half hour, Ellis Healing’s shot from the edge of the box was well saved by Johnny Perkins at full stretch, and the Irish keeper was quick to react to the rebound producing a great block to deny Brian Woodall’s follow up shot. But the Jacks ended the half well and went close to a third when Gordon Smith sent Nicol one-on-one with Dunn, but the Inglewood custodian stood tall to save. Inglewood needed a good start to the second half, but they were struggling in the final third, and it was the Jacks looking the brighter. Amphlett was found down the left on 50 minutes and he raced past his marker and cut the ball back from the bye-line, but Nicol couldn’t enough on it to beat Dunn. Moments later Nicol who went close again, but his shot on the run flashed wide of the upright. The visitors thought they had pulled one back on 67 minutes, Healings deep cross picked out David Cyrus at the back post and his header beat Perkins, but Tong was alert to deny his former team mates by heading the ball off the line. It was the best period of the game for Inglewood and moments later Jamie Murphy’s cross from the left found Brian Farrell, but his shot was saved low by Perkins. But despite their pressure, Inglewood found themselves 3-0 down on 78 minutes. A short corner from Nicol caught the visitors napping, and he exchanged passes with Smith before racing into the box and finished well past Dunn. Nicol thought he had his hat-trick three minutes later, after he turned home Steven McGarry’s cross, but after consulting his assistant, referee Arvin Shanmuganathan disallowed the goal for handball. Inglewood pressed late, and Woodall fired over the top after good work on the right by Feisal Zaw, before Cyrus volleyed over the top, but it wasn’t their day. There were goals galore in the other games on the day with Derek Johnstone’s under 18’s thrashing Inglewood 6-1. Daniel McKenzie opened the scoring early, but Inglewood levelled before half time. But the youngsters dominated the second half and two quick goals from McKenzie completed his hat-trick. Harry Blunt added the fourth before Dor Jok added the fifth and Lewis Tucker rounded off the scoring late. 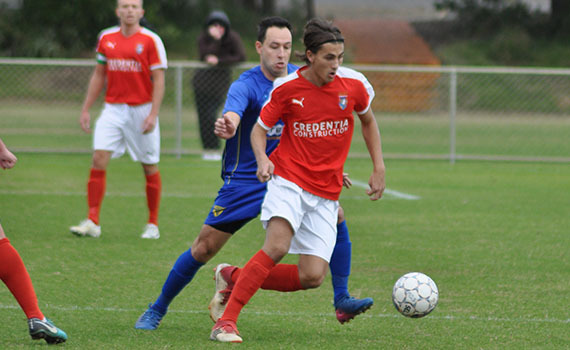 Mark Scanlan’s under 20’s maintained their lead at the top of the table after a 4-0 win against Inglewood. Paddy Doyle opened the coring before Ethan Brooks fired home after Liam Murray’s effort was parried by the keeper. The scoring was completed by Ben Hinshelwood who finished of some good lead up to score.